"Once again thanks to all the judges, stewards and everyone that helped on the day to make it another great test day at Grangewaters. The weather was not at its best, cold and windy but we all wrapped up warm, drank lots of tea and coffee and managed to survive. 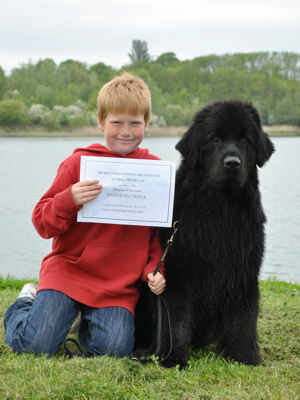 Some very good passes in Sections A & B and well done to Zac Logan, aged 10, passing A as a first time Junior Handler. Unfortunately we had to wait until the last Section E test for a pass at the higher levels, well done to calm and steady Ruby. Again thanks to everyone that attended and we are looking forward to seeing you all very soon." Hill's Sandbears Lady Guinevere "Amelia"
Irving's Forgebear Blue Lili "Lili"
Ormond's Shinglebay Bumming Around "Elvis"
"Thank you for inviting us to judge at your tests at Grangewaters. We had fouteen entries, twelve passes and unfortunately two fails. With a little more practice and training both will pass in the future. We would also like to thank the Grangewaters Working group for putting on a great event." "Thank you for inviting us to judge Section B at Grangewaters. We had five entries with two good passes and three fails, all on the safe swims. With a bit more practise all three will pass later in the year." "Three entries for C, unfortunately all three dogs didn't reach the required standard today. There were some very nice exercises by all three dogs but the retrieve of the stranger was the problem exercise. 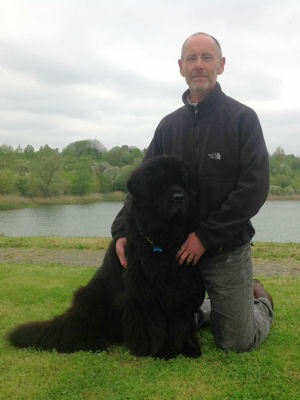 We are sure that with a little more work each of the dogs will improve to a better standard and gain a pass. Thanks to the SNC for the invitation to judge at this lovely venue and thanks as always to all the stewards, the Test Manager and all at Grangewaters for all their help and hospitality." "We had six entries but sadly no passes, the dogs needing more training on the D1 and D2 exercises. However, all of the dogs and handlers worked very well showing great teamwork and we were pleased with the number of entries at this high level so early in the year. Our thanks to all of the stewards and helmsman on this cold day and to everyone involved in making this an enjoyable day." "We had two entrants at this level on the day. The first dog was clearly not in work mode at all and decided not to co-operate. Her handler withdrew her after the first excercise, clearly knowing that she was just going to act the fool. In contrast the second entrant put in a faultless performance, working calmly and steadily throughout. Such a pleasure to judge and we were just as delighted to end the day on a high as her proud owners were. Many thanks to our excellent stewards and for the great atmosphere and hospitality we always get at these tests."